I thought there might have been an opportunity this afternoon for some photos around about high tide. So off i headed to Flat Rock to see what was going on. I parked up the road a bit, looking right into the barrel at the Cowrie Hole. There were a few good waves coming in, so I got out and set up the camera and started taking some shots. This guy slotted into this inside barrel. And then he just slid down the face, having the time of his life. Ain’t surfing fun? This guy was getting deep inside the section, using the old drop knee technique. And then got even deeper into the tube. Great stuff! After a while I went over to the baths and shot some stuff out the back at Flat Rock. There were a couple of good waves coming in but I think the photos from the inside section were better. I then wandered over to Newcastle Beach and there some guys out right down the end of Newcastle South Beach. I took some wide shots of the guys surfing under the cliff, but the ones above were the pick of the day. All in all, a fun afternoon of surfing and photography and I was relatively happy with how the photos turned out. cheers. Bird Photography at Blue Gum Hills Regional Park, 30th July, 2009. I had a struggle getting out of bed this morning, but eventually I dragged myself out of the cot about half past seven, dragged on my clothes, ate some Weet-bix and headed off to Minmi to have a look at the Blue Gum Hills Regional Park. I walked down to the garden, hoping to see the Bowerbirds again and get some good photos of them. But they were nowhere to be seen. Instead there were quite a few Golden Whistlers making beautiful music and flittering around in the trees. Further on over the creek I heard a commotion and a Grey Goshawk was flying away from some birds that were harrassing him. He alighted into a tall tree and stayed there for a while before flying away off to the east. He was a very lightly coloured bird, so I am thinking it was a pale morph, but I doubt it. 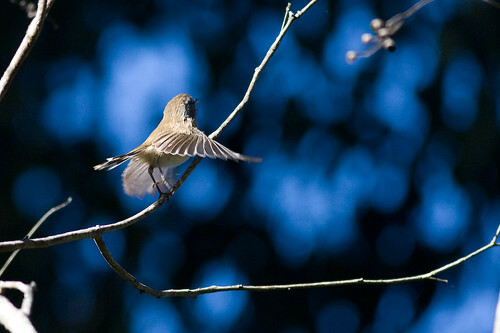 Maybe it was the light striking it, or its just a lightly coloured bird or an immature bird. I will do a bit of reading on it to see what the story is. We do not have the pale or white morph in our area, so that is unlikely. I took some photos of an Australian Magpie feeding on the ground and later on I had a pair of Brown Cuckoo-Dove, but I struggled to get decent shots of them as there was lots of shrubs in the way. Today 13 people from HBOC did the 2nd winter survey of Port Stephens, using 6 boats (skippered by NPWS and Marine Park personnel) to cover all the targeted area simultaneously. Overall, the results compare reasonably well with the first winter survey last year. We had 738 shorebirds including 588 that were migratory species. The count included 122 Australian Pied Oystercatchers – not as many as the 154 birds from last year but still an amazing count for them and confirming the importance of Port Stephens for this species. We found most were young birds i.e. <4 years old and not yet at breeding age. 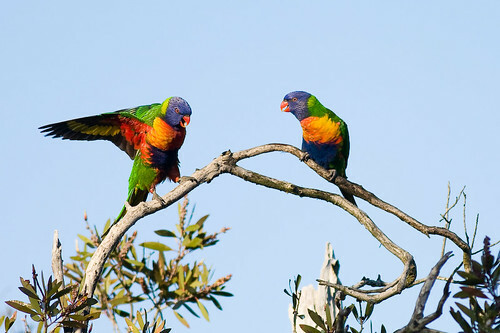 This suggests that young birds move to Port Stephens having hatched elsewhere. Clearly, more work is needed on this front (and we will look at getting your help on this). We had 340 Bar-tailed Godwits, very similar number to last year’s count. These will also be young (pre-breeding) birds that did not fly back to the northern hemisphere. The Eastern Curlew count of 223 birds is also very noteworthy and is in contrast with only 52 birds last year. Again these would be young birds and the count possibly that indicates the species had better breeding success in the 2008 season . Or it could just mean that conditions were less favourable for them in Port Stephens last winter. Several of us also had terrific views of a pair of Southern Right Whales frolicking in the middle of Port Stephens. * Jack Adams is keen to know of any sightings of Osprey from the East Lake Macquarie area. The old nest tree has been damaged in a storm and there have been very few sightings of the birds. However, last month Colin Goodenough reported seeing an Osprey at Marks Point oval trying (unsuccessfully) to get sticks onto a oval light pole. We’d like to know more about what’s happening with these birds. Let me know of any sightings you have had from East Lake Macquarie and I will pass them on to Jack. * I’m keen to know of any Pied Oystercatcher sightings from the Newcastle/Swansea/Lake Munmorah area in July. 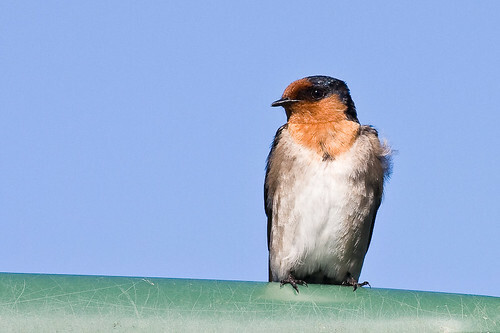 If you’ve seen any of them in the general area above in July, please let me know date, location, and number of birds. Bird Photography at Stockton, 29th July, 2009. This morning I drove over to Kooragang Island and went to the extreme South-east tip to see if there were any raptors fishing. But there was nothing – not a thing. Not even a seagull. So I drove over the bridge to Stockton and stopped at the Boat Ramp, hoping to at least see something. There were about 3 Australian Pelicans sitting on the break wall and that was about it. Again, not even a seagull. So I went to the Stockton Sandspit and parked under the bridge and went for a walk around the sandspit starting at the northern end. There were some Brown Honeyeaters twittering away in the northern end Mangroves, but I could not see them, they were staying well hidden. I walked past the mudflats and there were a couple of water birds and a dead Pelican on the beach. It was a very dismal day. The wind was howling from the north-west and I guess the birds were still in bed and staying there. 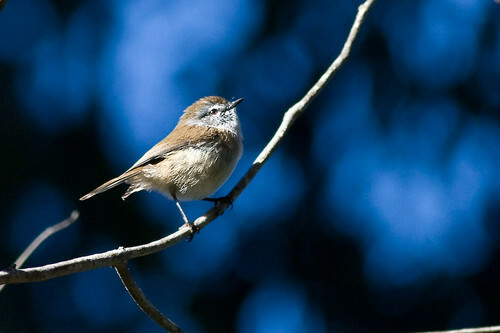 I poked around in the bush at the southern end of the sandspit and there were a colony of Superb Fairy-wren and some Brown Honeyeaters. I also heard a Little Wattlebird but did not see him. I went over to the other side of the channel hoping to see a Double-barred Finch but I had no luck. It was one of those dud days. Nothing happening at all so I just went home. doh! Bird Photography at Glenrock Lagoon, 28th July, 2009. This morning I went to the Glenrock State Conservation Area, commonly called Glenrock Lagoon. I parked in the area near the Kahibah end and walked along the walkway towards the creek. There were a lot of Bell Miners along the track and there were a few dead trees from the associated die back. Down at the creek a few White-naped Honeyeaters were swooping down to the creek to drink. A couple of White-browed Scrubwren were foraging around in the leaf litter. They love to chuck the leaves all over the place. I kept on walking towards the ocean on the northern side of creek, past the waterfall and down the road. There were a few Brown Gerygone in the trees twittering away. 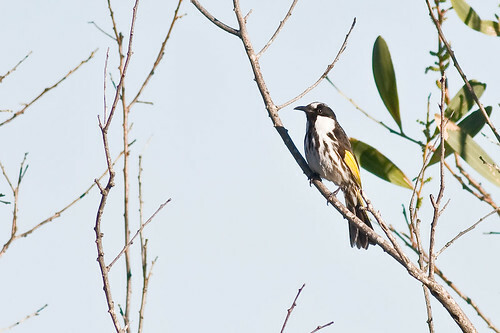 As well as quite a few Golden Whistlers and Eastern Whipbirds. On the way back there were a pair of Brown Cuckoo-Dove sitting up in a tree just next to the road preening themselves. Bird Photography at Newcastle Wetlands Reserve, 25th July, 2009. I was not sure where I was going this morning. So I just decided to go to the Wetlands Centre. On the way I stopped in at the University swamp. I am not totally sure of the correct name, but it is the swamp at the northern end of newcastle university. It is just opposite the Hunter Wetlands Centre. I think it is officially called the Newcastle Wetlands Reserve. I walked around the track and saw som Pacific Black Ducks, Rainbow Lorikeet, and quite a few Superb Fairy-wren. There were a bunch of Australian Magpie near the railway line and they were singing me some beautiful songs. I whistled back to them, of course. At one stage they flew really close to me, but did not seem to be threatening, just curious. I am reading a great book about the Australian Magpie and will write a report when I am finished. Also in the trees in the swamp were some Eastern Rosellas, Common Starlings, and a pair of Red-rumped Parrots (Psephotus haematonotus). 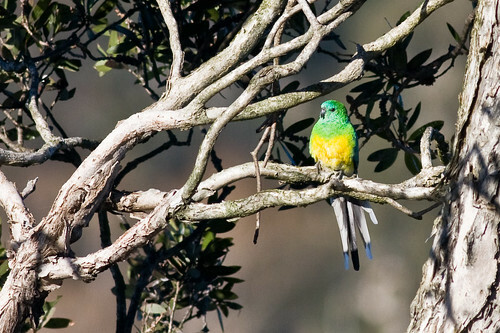 Red-rumped Parrots have a blue tip on the tail, which is mostly white, and the red patch on the rump of course. A Darter was drying his wings on a branch. The weather today was fine and sunny with the temperature at about 15 degrees Celsius. The wind was blowing lightly from the North-west at about ten knots. It was a beautiful day. Shortland Wetlands is listed as a wetland of international importance under the Ramsar Convention. I saw at the the main pond such water birds as Dusky Moorhen, heaps of Magpie Geese, Australasian Grebe, Eurasian Coot, Hardhead, Chestnut Teal and Grey Teal. Some of the bush birds that were hanging around the pond were Black-faced Cuckoo-shrike, Australian Raven, Magpie-Lark. I walked around the pond towards the western area. 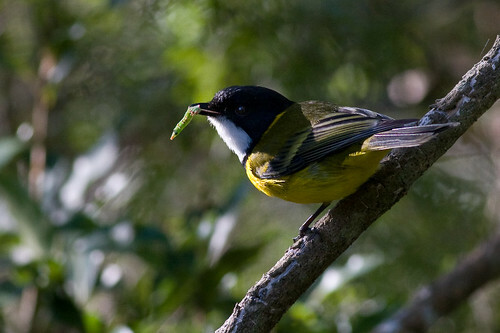 There were a few Superb Fairy-wren on the path and a couple of Yellow-faced Honeyeaters, a Striped Honeyeater and some White-cheeked Honeyeaters as well in the eucalypt trees. 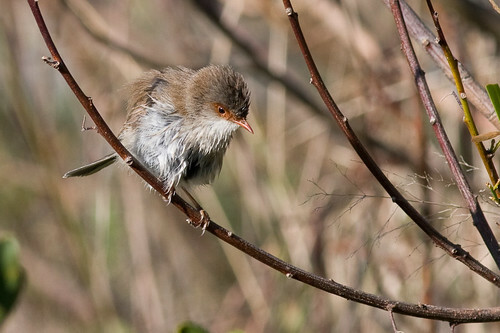 Along the western side of the breeding pond I found a bunch of Variegated Fairy-wren. There were heaps of Australian White Ibis on the pond and a Swamp Harrier was circling and darting into the pond. And then about 15 Yellow-tailed Black-cockatoo flew past making the biggest racket. It was the biggest mob of them I had ever seen. Bird Species List, Hunter Wetlands Centre. Bird Photography at Blue Gum Hills, Minmi, 24th July, 2009. This morning I took off to Blue Gum Hills Regional Park at Minmi, west of Newcastle. The weather was partly sunny and partly cloudy and the temperature was about 15 degrees Celsius. The wind was coming from the South West at about 15 knots. First up I spotted a male Satin Bowerbird up in a tree and he was breaking off some twigs. Then he flew off down into some bushes. The spot he flew into was a spot I had suspected was something going on in. Well I snuck into the undergrowth and the male had already flown off. And then I found his bower. It was a beautiful arch with about a dozen blue pegs scattered outside as decorations. What a good forager he is. 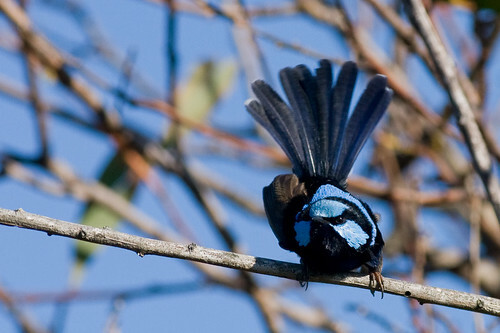 He is sure to impress some lady Satin Bowerbird for sure. Here is a photo. Not a very good one because I could not get a good view with my big lens. Hopefully I will get a better photo with a wider lens some other time. 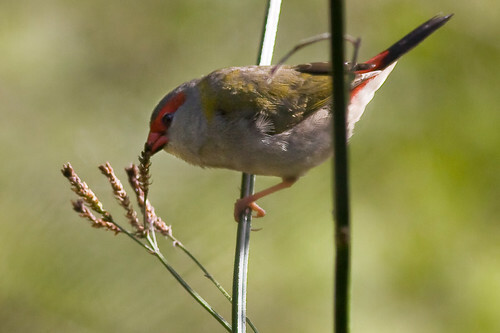 After that, I carried on over the bridge into the garden and spotted a Red-browed Finch chomping on some grass seeds. Again, its not a great photo but it is worth showing because of the behaviour. 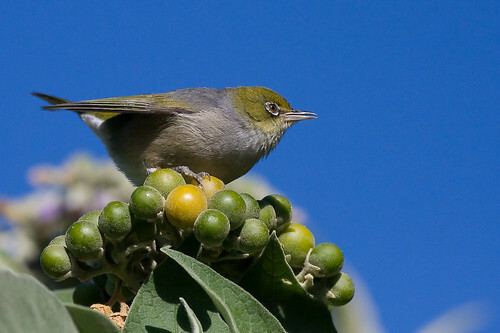 There were no further Bowerbirds but the Silvereyes were feeding on the Tobacco Bush fruit. As far as I can tell, there were two races – lateralis and westernensis. Zosterops lateralis lateralis and Zosterops lateralis westernensis. 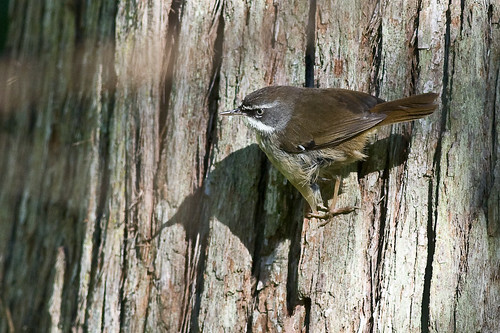 The lateralis is the race that migrates from Tasmania to New South Wales in winter. The westernensis is the local race. 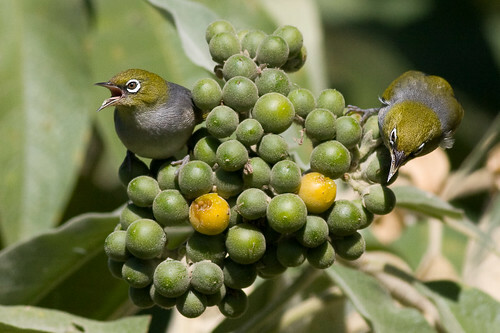 This photo is of a pair of Silvereyes eating the Tobacco Bush fruit. You can’t really see the diagnostic markings on this photo so well. 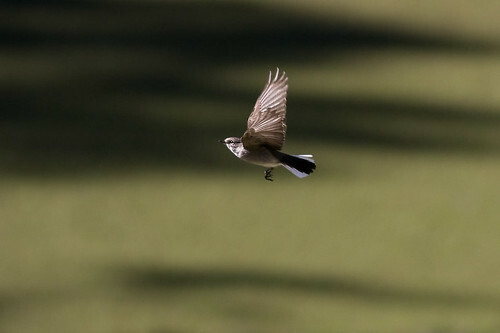 But the lateralis race has a rufous flank and whitish under the throat, whereas the local westernensis race has lemon coloured under the throat and a lighter flank. Some books call the local race familiaris but I don’t know about that. Its all a bit confused at the moment, depending which book you look at. I went around the park another time, but nothing much was happening. The ranger said that a Cicadabird had been seen last week so I kept my eye out for one but did not see any. Bird Photography at Tomago Wetlands, 21st July, 2009. This morning I went to the Tomago Wetlands, which are adjacent to the Hunter River on the northern side. I guess it is almost opposite Ash Island. We had to go in via a roundabout route and it was a bit muddy, but we managed to get through all right. We stopped at the flood gates and saw a Mistletoebird and a few Silvereye. 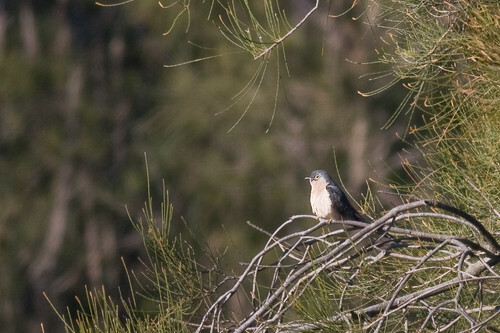 We also saw a Fan-tailed Cuckoo in the same general area. We turned off towards what is called the rice paddy and followed the levee banks around the paddock. We saw some Golden-headed Cisticola and Black-faced Cuckoo-shrike. 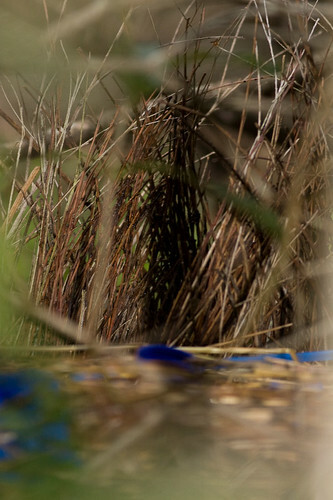 A couple of people walked through the field and flushed a couple of Australasian Bittern (Botaurus poiciloptilus). A Black-shouldered Kite was hovering to the east and there was a Swamp Harrier hovering around at times. We completed the circuit of the “rice paddy” and walked up the road a bit and then turned back. After that, we went to a field further around to the east and went for a walk around the wet fields. We only saw a few Golden-headed Cisticola, an Australian Magpie and a pair of Australian Pipit. Back at the start of the field, we spotted a couple of Grey Butcherbirds, some Striped Honeyeaters, a few Black-faced Cuckoo-shrike and an Olive-backed Oriole. There were a few raptors wheeling about high in the air – a Brown Falcon, Swamp Harrier and a White-bellied Sea-eagle. Well that was about it for the day. Quite a good day for spotting birds, seeing it is in the middle of winter. My photos were not so great so I was not impressed with that, but I had an enjoyable day out. After a nice feed, I went for a surf at Bar Beach. At around mid-day the temperature was about 21 degrees Celsius. Nice and hot for winter. This morning was a HBOC trip to Martins Creek, near Paterson in the Hunter Valley. We all assembled at Maitland Station and then went up the road past Paterson and on to Martins Creek. I had no idea where we were going so I was glad to be a passenger in that convoy. We got to the property and walked up this massive hill and saw a Wedge-tailed Eagle up the top. There was a nice variety of heath and eucalypt country and we spotted some Brown Thornbills and a very nice Shining Bronze-cuckoo up in a tree. We followed the ridge along and near the waterhole we spotted three Bar-shouldered Dove on a dead tree overlooking the hill. 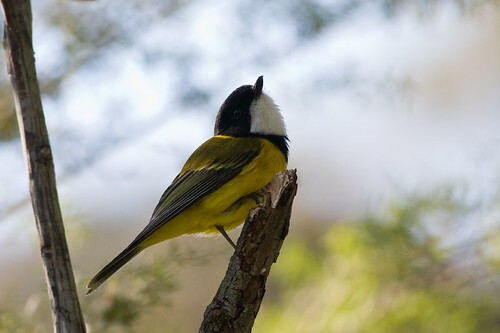 There were also Yellow-faced Honeyeaters, Golden Whistlers, and White-naped Honeyeaters around. We trekked through the bush and spotted a Wedge-tailed Eagle’s nest. It was huge. But nobody was at home. We then went through a lovely patch of rainforest that had been regenerated by a crew. Well done, bush regeneration crew! We then went back down the hill, the very large and steep hill, that is. 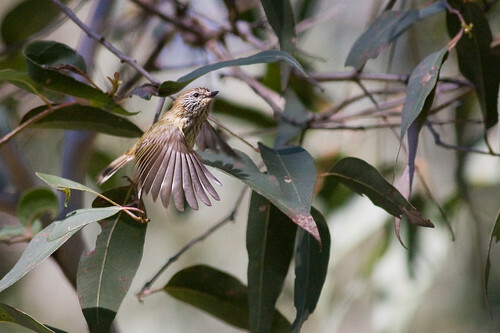 Half way down there were a mob of Striated Thornbill (Acanthiza lineata). At the bottom of the hill, we spotted heaps of birds. A pair of Jacky Winter were hanging around the fence line. There were quite a few Buff-rumped Thornbill who were foraging on the ground and low amongst the tree trunks and shrubs. 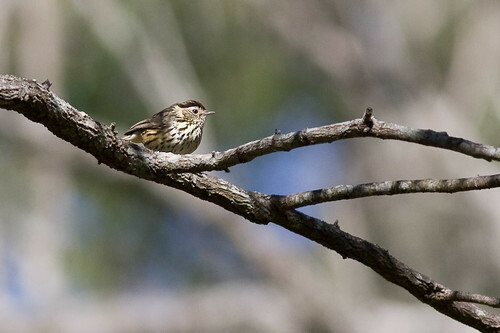 Then Michael spotted a Speckled Warbler (Chthonicola sagittata). What a great find. I had never seen one before. We had morning tea and then went for a walk down the road. We saw a very large mob of 21 White-winged Choughs and they were having a fight with some Magpies. It was quite a kerfuffle. 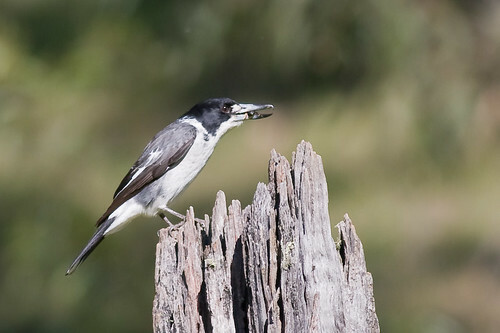 Along the road we saw Kookaburras, Galahs, Australian Wood Duck, and this Grey Butcherbird with his dinner. At the end of the day, a Nankeen Kestrel was wheeling high over us to speed us on our way. They usually hover a lot lower. Well that was it, a lovely day with lovely company and some new birds to see. Bird Photography at Belmont Lagoon, 18th July, 2009. Its been a few days since I have been able to get out and photograph some birds, but this morning was a beautiful sunny day with little to no wind. I took off down to Belmont Lagoon. I haven’t been there for a while, so it was good to get back there. There was a Little Pied Cormorant perched on the wire, drying out his wings, a few Galahs flew by in the distance, and there were a bunch of Yellow Thornbills and Brown Thornbills flittering around the casuarina trees along Cold Tea Creek. I went right after I got to the end of the Cold Tea Creek track and I saw a few Southern Emu-wren but never got a chance to photograph one, they were moving around too much for me to get focus on them. But there were quite a few New Holland Honeyeaters in this area as well. I thought they were White-cheeked Honeyeaters at first because they are more common in this area. But I had a closer look and they had the white eyes which pretty well gives the game away for the New Holland Honeyeaters. I saw a few rabbits hopping around. It would be a good idea to get rid of them somehow I reckon. But, how? I followed the track towards the left, going north, towards the Belmont Wetlands and took the track to the east of it. I was looking out for any raptors in the dead trees in the swamp, but there were none at all around today. 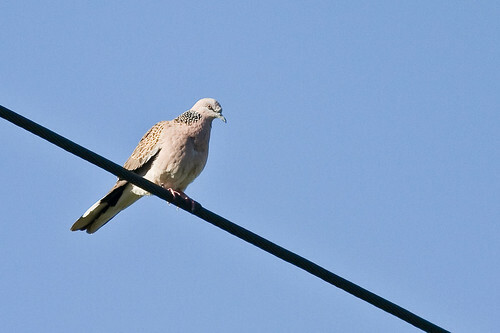 Just a lonely Spotted Turtle-dove hanging out on the wire. I thought it was a White-headed Pigeon at first because he was so light, but as soon as I saw the spots around his neck, I knew what he was. The Spotted Turtle-dove is also known as the Chinese Turtle-dove or the Indian Turtle-dove. 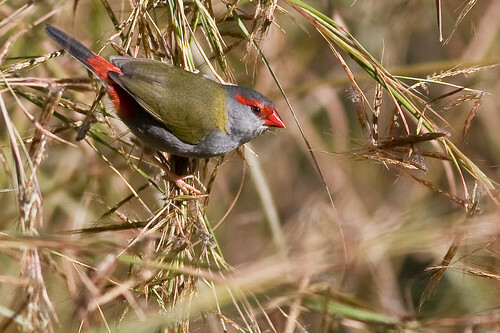 I went back along Cold Tea Creek and saw a flock of Red-browed Finch feeding on the grasses at the side of the track. Nearly back at the car and there was a Great Egret and a Darter sitting on the pipe that goes across the creek. And the usual Australian Wood Duck. After that I went for a surf at Blacksmiths and had a great day in the sun. What a beautiful day!